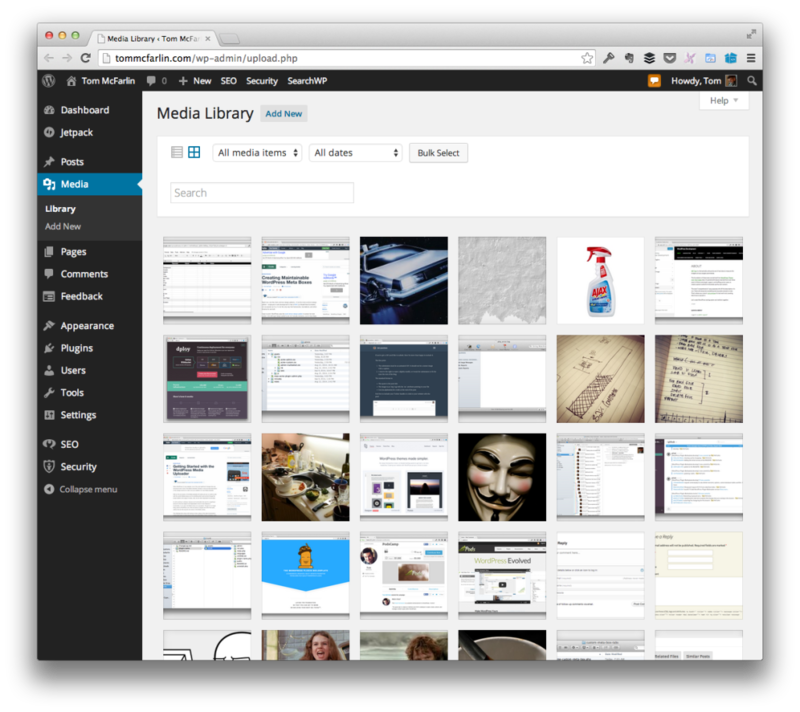 Media is a tab in your WordPress admin sidebar which is used to manage user uploads (images, audio, video, and other files). In this tutorial, You will learn about WordPress Media, Media Library, how to Add and Insert Media and how we can Edit Media files. In Media Library Option , we will learn about Media Library in WordPress. Media Library consists of the images, audios, videos and files that you can upload and add to the content when writing a Post or Page. Here you can view, add, edit or delete any media related objects if not needed. Following are the steps to understand about Media Library. Step 1 − Click on Media → Library in WordPress. Step 2 − You can view media files like images, audios, videos. Click on Add Media button. Step 3 − The Upload New Media page gets displayed. List View − Displays the images and videos in list form. Grid View − Displays all images in the grid format as shown in the following screen. Filter the images and videos − Filters the images and videos. Search Box − Helps to search a particular image by inserting the name into the box. Now we will study how to Add Media files in WordPress. WordPress allows you to add, all kind of media files like videos, audios and images. Following are the steps to Add Media. Step 1 − Click on Media → Add New in WordPress. Step 2 − Then, click on Select Files option to select the files from your local storage. Step 3 − Add Media files such as images and audios by selecting them and click open. Step 4 − You can view the list of media files added. In Insert Media Option, we will study how to Insert Media in WordPress. Media files can be inserted to your Pages or Posts from libraries, from local storage or from URLs. Following are the steps to Insert Media in WordPress. Step 1 − Click on Posts → Add New in WordPress. Step 2 − Click on Add Media. Step 3 − You can select the files from the Media Library tab. Information about the selected media file will be displayed on the right side of the screen under the Attachment Details. Click on Insert Post button, the image will be inserted into the post. In Attachment Details section, you will find information about the images such as URL, Title, Caption, Alt Text and Description. You can also insert an image directly from your system by clicking on Upload Files tab. Click on Insert into Post button. In Edit Media, we will study how to Edit Media in wordPress. You can manage all the information about your media that is saved in the Media Library. Following are the steps to Edit Media in WordPress. Step 1 − Click on Media → Library and click on the name of the media item or the edit link. Step 2 − You will view a list of media files. Select any one image to edit. Step 3 − You can view the edit media page with few options on the right side. URL − You can read only a link from media file. Title − This displays the name of the media. Title is often shown in galleries and attachment pages, if themes or plugins are designed to display it. Permalink − Permalink is the URL of the media attachment page. This is also a link to view the attachment page. Edit image button − This allows you to edit the image position, such as rotate counter-clockwise, rotate clockwise, scale, crop, flip vertically, and flip horizontally. Caption − A brief explanation of the media. Alternate Text − The alt text for the image, which is used to describe media. Used for availability. Description − An explanation of your media file. Delete Permanently − Delete your media file permanently. Step 4 − Once you complete editing the required fields, click on Update button to save the changes made to an image.